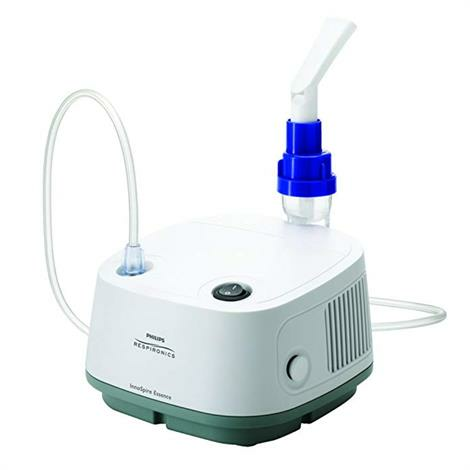 Respironics InnoSpire Essence Compressor Nebulizer System uses SideStream Aerosol Technology and provides fast and efficient aerosol drug delivery. The Essence is a home use model and provides affordable aerosol treatments. Innospire Essence is a nebulizer that has a simple mechanism to deliver aerosol medication. Unique design of SideStream nebulizer provides consistent delivery of medication time after time. Innospire Essence can be used for effectively treating asthma. It is compliant with the international safety and essential performance standard IEC 60601-1 third edition and its amendments. Philips Respirionics InnoSpire Essence compressor nebulizer system is lightweight, easy to use and a perfect little delivery system. At just 3.3 lbs, InnoSpire Essence combines a powerful compressor and compact design to create a nebulizer system, which makes compliance easy and stylish. It balances simplicity and effective delivery for a session that is simple with a device that is easy to use and store. Combined with proven SideStream technology, Essence is compact, lightweight and easy to pack for travel. Its stylish design incorporates a handset docking station, filter and power cord and blends gracefully into the home environment. Handset docking station ensures that therapy treatments are convenient and easily set the nebulizer/mouthpiece upright. 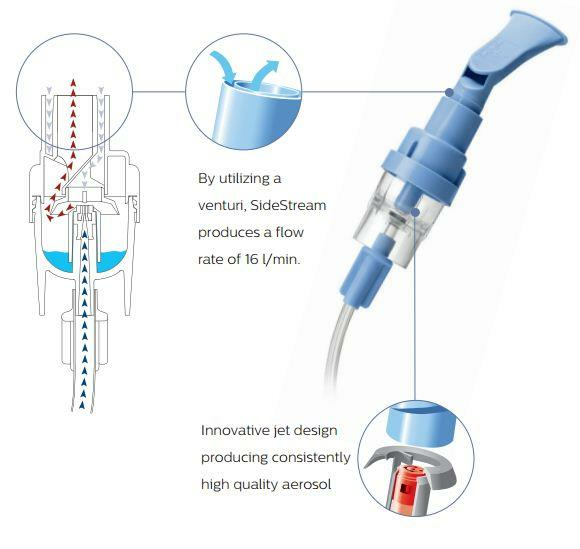 InnoSpire Essence works efficiently with SideStream nebulizers that feature an Active Venturi System, providing air flow in addition to that supplied by the compressor, resulting in faster drug delivery and shorter treatment times. 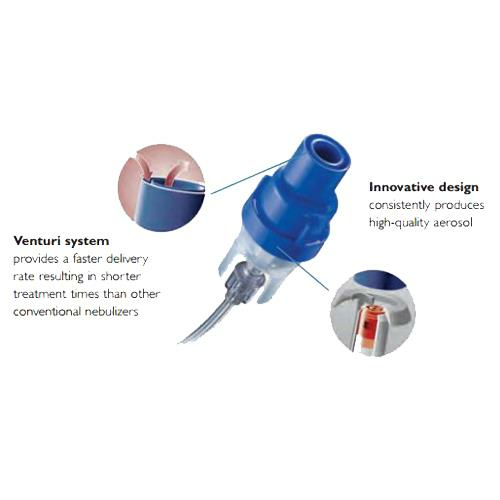 Venturi system pushes air along with the medicated aerosol so that the patient can breathe in more per inhalation. 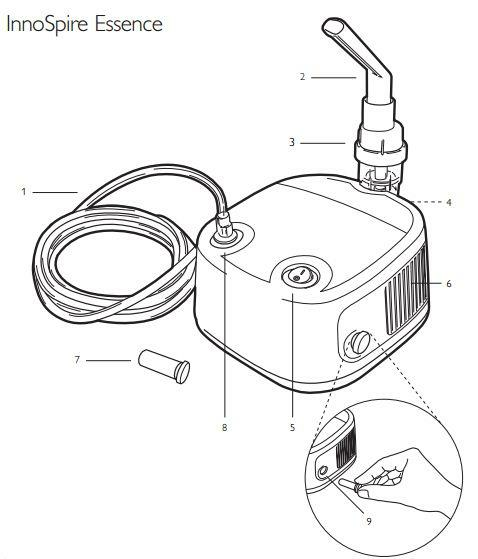 They are easy to use with fewer parts to assemble or clean than other conventional nebulizers. A refined design and an economical choice! When cost is a primary consideration, InnoSpire Essence is chosen. It is an economically priced Compressor Nebulizer System, which ensures that the customer saves on the bottom-line yet delivers powerful aerosol treatments. The SideStream nebulizer has been developed as a result of considerable research into aerosol therapy. SideStream nebulizers are suitable for nebulizing all commonly prescribed aerosol therapy medications, including antibiotics, bronchodilators and steroids. Active Venturi of SideStream and the nebulizer top are designed to draw in additional air during inspiration. Added to the flow from the compressor, this additional air boosts aerosol output rate up to 16 l/min and reduces treatment times. SideStream keeps the driving air and the liquid drug separate. This, combined with the use of durable materials, enables reproducibility in performance between all individual units and minimizes the potential for wear and blockage. Never operate the device without the Replacement Air Filter. Filters should always remain inside of the system when operating the it. Can this machine be used with a mask? Yes, Respironics InnoSpire Essence Compressor Nebulizer System can be used with a mask. Today the machine seemed to work fine with both the albuterol and the Budesonide. However I would still like to know if this is a jet or ultrasonic nebulizer. Thank you. Respironics InnoSpire Essence Compressor Nebulizer System uses Jet Nebulizer technology. Do you put medication in the machine? Respironics InnoSpire Essence Compressor Nebulizer System features a docking station that stabilizes the nebulizer cup to help you more easily pour in the medication. It has a unique design that provides consistent delivery of medication time after time. Can it be used for pediatric patients too? Yes, it can be used by all ages. My 90 year old mother has been using this nebulizer since the middle of August. 2 days ago, she called in a panic saying the nebulizer was not working properly. She uses it 2 times a day with Albuterol. I checked the tubing, took it out, took the cup apart and put it back together. The compressor is working, air is going through, but not making any "steam". Would like to remedy this problem as soon as possible as these treatments make mom's life a little more comfortable. "Thank you for contacting us. I’m sorry to hear you are having difficulty with your nebulizer. If no steam is coming out of the machine, please check the baffle in the middle of the medication cup, if it is not in there, then no mist will be coming out. You may need a new medication cup setup. Please call your doctor for a prescription a new drug aerosol setup. I do hope this helps. Have a great day."